The second PLAN-Boulder County City Council candidate forum took place on Friday September 20th, 2013. This was originally supposed to be the final of three such fora, but Mother Nature intervened with the floods, and the one planned for (lucky) Friday, September 13th was rescheduled to Monday, September 23rd. The moderator for this forum was Bruce Goldstein from the PLAN-Boulder board. Alan Boles was the timekeeper. 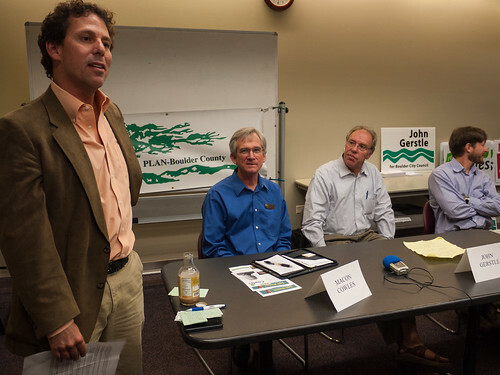 The four candidates present were incumbent Macon Cowles, Boulder County planning commissioner John Gerstle, former Boulder Planning Board member Andrew Shoemaker, and current Planning Board member Sam Weaver. If we want to wreck the planet completely, we don’t have to change anything—we’re doing a great job right now under business as usual. My parents were active in the civil rights and peace movements, and I’ve carried their values into my law practice; I’m a firm believer that the law isn’t settled until it’s settled right. So we’ve got to keep working until it’s right. We have to get the metabolisms of our cities right—we have to change the way that they ingest and utilize resources. Over the last 6 years I’ve worked to reduce the city’s existing funding gap. I say yes to municipalization. Yes to an 80% reduction in emissions. Yes to regional transportation system changes. I grew up in Boulder, and have been at home here for more than 50 years. It’s been great to be part of a city that’s been so visionary with the growth boundary, height limit, and blue line. By training I am a water resource engineer. I’ve been been active on a variety of appointed boards in the city and county, and am currently chair of the county planning commission. I know many of you through different avenues—through my work bringing the USA Pro Cycling Challenge to Boulder, as a Pearl Street business owner, as a former member of the city’s Planning Board, as a volunteer for local non-profits, through my work popularizing our open space programs across the country, or as a fellow hiker out in that open space with my dog. I worked hard to defeat the high density Junior Academy redevelopment plan, and the high density Washington Village plan. I grew up in Tennessee, and energy was a topic of daily conversation around the dinner table. My father was a nuclear engineer, and I was immersed in engineering throughout my childhood. I studied engineering at Caltech. I’ve been in Boulder for 24 years, first living up on Sugarloaf, where I served as a volunteer firefighter, including being elected by my fellow firefighters to serve as Chief of the Sugarloaf fire protection district. In 2008, I moved down to the City of Boulder to start my company, Cool Energy, which develops technology for industrial waste heat recovery. I also worked on a 2008 ballot initiative that would have put a price on carbon in Colorado. Q1: The question of annexing the Hogan-Pancost property into the city is coming to City Council on October 3rd. If you were on council, what would be the most important consideration in making that determination? John Gerstle: The only reason we should ever annex property into the city is when there is a clear community benefit. In the case of Hogan-Pancost, there are clear adverse impacts to the neighbors. I would vote no. Andrew Shoemaker: Hogan-Pancost is currently part of the Area II planning reserve, within the city’s designated growth boundary. If it’s not suitable for development, then we should go ahead and change its status to Area III. There would be benefits to the community of building additional housing in Boulder—there’s a shortage of detached single family housing here. Sam Weaver: There were some community benefits to the proposed development plan, including the creation of a congregate care facility. However, in the end, the development did not seem equitable, because of groundwater impacts to the neighbors. In light of the possible effects of climate change on our rainfall patterns, I would definitely be concerned about increased flood risk. Especially without a site plan, it seems very difficult to see clear community benefits. Macon Cowles: I’m trying to give all sides a fair hearing, but I do wonder, what kind of message we would be sending to potential developers by annexing the area without even having a site plan? I also want to know more about the groundwater impacts and potential consequences for flooding. The adjacent neighborhood is also not blessed with a permeable grid of streets, so additional traffic in the area would be concentrated on a few arterials. Q2: What are the major issues facing us regionally? Andrew Shoemaker: The big regional issues are clearly housing and transportation. It takes about 2.7 minimum wage earners to rent a 2 bedroom apartment in Boulder. We have a serious housing shortage. I’ve wondered whether we might be able to utilize the land acquisition expertise of our Open Space program to somehow secure more land for housing elsewhere and facilitate the busing in of service workers and other employees. We’ve made good progress on addressing climate/energy issues, or at least the process is well underway, but we’ve made much less of a dent in our regional transportation and housing problems. Sam Weaver: I don’t think we’ve actually done everything we need to with respect to energy and climate—we’re very much still working on this, and it will be an ongoing project for many years to come. For housing, we should really look at making it easier to create ADUs (accessory dwelling units). We should consider changing our constraints on density in some corridors, and do a better job of getting our several developing city centers connected to each other by means other than driving. Macon Cowles: Many of the biggest issues we face are things that unfortunately can’t be fixed locally. Colorado has slid from near the top of educational spending to the very bottom nationwide. We need to make our urban spaces more urban so we can save the wild places—this gets back to the healthy city metabolism that I mentioned in my introduction. I’ve spent time at DRCOG (the Denver Regional Council of Governments) working to integrate reductions in VMT (vehicle miles traveled) and greenhouse gas emissions into our regional transportation planning documents. John Gerstle: The biggest regional issue is transportation. If we address it well, many of the other regional issues we face will have also been addressed. There are a lot of misconceptions about the housing problems we have here. No matter what housing proposals we adopt, there will continue to be a lot of commuting regionally, and there will be a lot of people who won’t move into town, who will prefer to have a bigger house, a bigger yard, and a longer drive. There’s very little we can do about that. Q3: Many feel that the planning department is biased in favor of developers. What do you think? Sam Weaver: Planning works closely with developers. Planning Board’s job is to work with staff and developers to decide whether what comes in front of us really works toward the comprehensive plan goals. I think previous Planning Boards have probably been more lenient, while the current one has been tougher. There’s certainly a familiarity that develops through this work, but I don’t know that I’d go so far as to say there’s a bias. Macon Cowles: The most important thing we can do as a community is say NO to things that hurt us. Remember that our planning department is also in charge of our environmental sustainability. They don’t want to blow-out our carbon emissions. If we want to keep the wild places wild, we should be working to make our urban places more urban, in a human friendly way. We need to be giving people 15 minute neighborhoods, where our daily needs and errands can be satisfied within enjoyable walking distance. John Gerstle: Developers are the ones by-and-large that are proposing action. Saying NO can only get you so far. It can keep things from getting worse, but it can’t really make things better. This sense that change is being driven by developers could be mitigated by the city actually getting out in front of them with some proposals for what we DO want! Andrew Shoemaker: I think we’ve got one of the best planning staffs in the state, if not the nation. We passed Smart Regs and Compatible Development in the face of stiff opposition by developers. However, I do recall that staff had a first-name relationship with many developers, and while I was chair of the Planning Board I had a policy requiring everyone to address each other formally, with Mr. and Ms. It seems like a little thing, but it definitely helped the board’s sense of decorum, and the public image of the relationship between city staff and the developer community. Q4: Many feel Boulder and other cities are facing a Tech Bubble. How should we insulate ourselves from the inevitable burst? Macon Cowles: I don’t think that a tech business bubble is so much an issue today. I do think that we face a different problem, of our entire society being mediated through mobile network devices. It hurts our interpersonal relationships and the social fabric we exist within as a city, when everyone is continually absorbed by these omnipresent screens. John Gerstle: I don’t know that there’s any such bubble, and even if there was, I don’t know that that’s Boulder’s problem to solve. The tech sector is a significant portion of our local economy, and we shouldn’t be shy about encouraging it. We have very little control over the larger economic forces. Andrew Shoemaker: I agree with some of what Macon is saying on the social impacts of ubiquitous technology, but I wouldn’t want to focus on the negative aspects. There are lots of good outcomes too. For instance, we don’t have to xerox papers in my law firm any more. It’s all digitized. Technology is tough for all of us to adapt to in our own ways, but with that change there’s a lot of opportunity. Sam Weaver: From the city’s point of view, the most direct concern is really how a “bubble” would affect our revenues. And from that point of view, we actually have a pretty diverse economy. We’ve got natural foods, outdoor gear and clothing, and within “tech” there’s actually pharma and biotech and clean/green tech in addition to the internet and web-based tech stuff, which I think comes to mind for most people when we talk about tech bubbles. There are good effects like paper saving, but we also need to be conscious of the externalities associated with our data systems, including their energy footprint and our e-waste stream. Q5: What’s your opinion on the Area III planning reserve? John Gerstle: It’s got a special status, reserved for some future unidentified use. It can stay that way for a long time. We don’t need to decide on it now. It’s the last big chunk of land available within the city’s designated growth boundary. Eventually it will be a part of the city, but we’re right to wait for some really unique thing that can only go there. I believe it should continue to be a joint city/county process. Andrew Shoemaker: The Boulder Valley Comprehensive Plan states very clearly what Area III is for. There’s still no obvious opportunity for its development. It’s a long term reserve. I’m also in favor of the 4 body review. It’s going to be preserved for a long time. We just need to be mindful of the existing rules in the comp plan. Sam Weaver: Area III is just north of city, across US 36. It seems very unlikely that there’s going to be a project good enough to justify developing that area. I also agree that it should still go through 4 body review. I can’t think of something right now that would ever be good enough… but who knows, maybe it’s possible. Macon Cowles: It’s amazing to talk to other people around the country about our urban growth boundaries—since 1978 we’ve actually shrunk our growth boundary. It seems likely that nothing will happen in Area III within the lifetime of anyone in this room because of the 4 body review. And if something were able to make it through, then it would probably be something that we wanted. Q6: What would you do to address the nearly 60,000 people who commute in to Boulder every day? Andrew Shoemaker: Why can’t we make it so easy to use transit that they don’t want to drive? Why do we even require people to have an EcoPass? Why not just make buses like the Hop and Skip free? This is an issue that can only really be addressed regionally. Sam Weaver: I think we need to ask, are we set up to get the community that we want to have in 20 years? Does our zoning even let us build the city we want? I’m in favor of zoning changes at Boulder Junction. Increasing the density of selected areas is probably both inevitable, and desirable. I wish we could get the Northwest Rail line, but it just doesn’t seem to be happening. We should get the US-36 bus rapid transit up and running, and make the best use of it we can. We should continue to buy-up local service improvements from RTD. We need to work on getting more and better separated bike infrastructure in town, to help the “interested but concerned” folks feel comfortable riding bikes for their daily transportation. Macon Cowles: The loss of the rail line has taken a lot of the air out of the room on regional transportation solutions, but actually a huge number of our commuters come from the communities due east of us. Now that the train is finally dead, we can have a serious conversation about getting a much better regional bus system up and running. Unfortunately, RTD has been problematic. For instance, refusing to run buses between Nederland and Boulder while Boulder Canyon is closed to traffic. It means a lot more people are driving. John Gerstle: Buses are the best option we’ve got at our disposal right now. We need to get a regional BRT system up and running. It’s an economical and flexible option. We need to encourage RTD to be more responsive to our needs… if that means we need to dedicate more funding from the city transportation budget, so be it. Q7: Within the city’s budget, what is most underfunded, and how would you go about funding it? 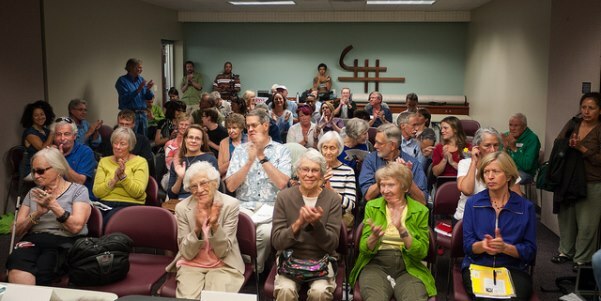 Sam Weaver: Unlike most cities, we fund social services, but we could do a better job. Transportation is also subject to chronic shortfalls, and is a vital part of what makes our city so livable. I’m in favor of the three sales tax measures on the ballot now (2B, 2C and 2D). In the longer run we should work toward a more diverse set of funding mechanisms. Macon Cowles: I agree with Sam on Transportation. The shortfall is huge, for a system that’s so vital to the community. It can’t be sustainably funded with a gas tax. The shortfall results from increasing costs and decreasing revenues. The biggest uncertainty in our transportation system is the in-commuters. With copious free parking, we have little hope of getting them under control. John Gerstle: The two things that jump out are Transportation and Social Services. Social Services is largely funded out of the general fund, and goes to supporting local NGOs and non-profits. We should do a better job of that—these organizations are a great value proposition, since they’re willing and able to raise money from other sources too. For transportation funding we have several options, one of which is to impose a head tax. If the costs are largely driven by in-commuters, then we need to capture funds from them. We should consider limiting the ways that employers provide parking for employees, maybe including having parking maximums rather than minimums for commercial developments. Andrew Shoemaker: Helping others is a part of Boulder’s soul and we should continue that tradition, but part of the problem here is a regional social services deficit. We need to address that county-wide. Similarly, we need to work with Longmont and the other places that many of our daily workers come from. We could do a better job of coordinating the work NGOs do with the county and city. I’m in favor of a community-wide EcoPass program, as well as the sales tax measures on the ballot this fall. Q8: How well is the city doing at assessing flood risk? What could we do better? Macon Cowles: I think we’ve generally been doing a good job on this. It costs money, but in the long run it pays off. We all pay a fee on our water bill to get rid of dangerously located structures. The Greenways program has been very successful, but it’s still not done. We need to get the system finished, especially in North Boulder along Fourmile and Wonderland Creeks. We should also make the best use of our experiences in the last week—having seen where the water actually ends up flowing, and how that meshes with our flood models. John Gerstle: Generally, I think we’ve done a good job. We might need to tweak based on the last week’s experience. We need to look at Hogan-Pancost. There are also some existing channels that didn’t perform very well, like Twomile Creek. We need to do a good job of maintaining our floodways once they’re built. Andrew Shoemaker: Having been on the Greenways Advisory Committee, I really feel we did a very good job. We’ve done great things, they’ve worked, but we’re not done yet, and we’ve got some older areas that need to be retrofitted. New developments are doing much better. We should do a better job of getting information out during a crisis, and have a better emergency operations plan. Sam Weaver: I also agree that we’ve been doing a good job. The critical services ordinance that we just passed is a big step in the right direction, and yes, we should definitely learn from recent events. Q9: Good design is key to getting neighborhoods to accept infill development. Are we doing enough to ensure good design in our affordable housing developments? John Gerstle: While I agree with the concept generally, it’s nebulous. The really hard work is in defining what exactly “good design” consists of. Andrew Shoemaker: I’m generally opposed to adding density within our existing neighborhoods. There are other places we can do it—in our existing transit corridors like Broadway and Arapahoe, as well as more generally in the eastern part of town. And yes, of course, we should aspire to good design in all these places. Sam Weaver: One of the main ways that any such standards end up getting enforced is through site review, so it’s important to have good folks on our boards. I’m in favor of sensitive increases in density. Having a diversity of different housing options is great. I’ve toured the newer developments in NoBo, including the co-housing, and I have to say, I’ve seen a big range of design and building qualities. Macon Cowles: Boulder is willing to defend its neighborhoods. People want the timeless design. Unfortunately, most developers see new construction as a 7 year asset to be built and transferred. We’ve got to get away from that mindset—we should be creating buildings that will last and be loved and re-purposed creatively for generations. Polls have shown that people in lots of places want the same kind of things… the difference is we’re willing to fight for it. Q10: How do you weigh a very strong staff recommendation against other opinions? Andrew Shoemaker: You’ve just got to read the materials and come to your own conclusion! Make your thought and decision processes clear and transparent. Sam Weaver: Boulder has a lot of great staff, but we always need to make sure that we do a good job of reaching out to the community to get their feedback directly, for example the way we did with the Civic Area Plan. And we need to work to understand the root causes of the objections we hear. Macon Cowles: There are 2 things our community generally hates: sprawl on the one hand, and density on the other. Staff doesn’t generally just make stuff up on their own. They’re usually being guided by high level policies that we’ve already got on the books. When there is disagreement, it’s often the result of conflicting interpretations of our existing planning and policy documents. Usually when we reject a planning staff recommendation it’s because their proposal is in conflict with another approved community plan. John Gerstle: We’re not elected to balance trade-offs and make compromises. We’re here to achieve outcomes, guided by our established policy statements. Q11: Recycling is a powerful way to reduce greenhouse gas emissions. Today the business landfill diversion rate is only 17%. Should we change that, and if so, how? Sam Weaver: Yes, of course we should get that up to 100%. The real question is how we get there. My business recycles, and it’s been a great experience in bringing mindfulness to our business processes. We have to realize that there is no such place as “away.” All these materials come from the earth, and when we’re done using them, they go somewhere. Ultimately recycling will just become an integrated, everyday part of our economy, and it need not be an onerous requirement. But we’re going to have to go through a process to transition businesses to that state. Macon Cowles: Recycling has been an orphan for a long time in terms of GHG emissions. We can’t manage what we don’t measure. Something like 30-40% of all GHG emissions stem from our material systems management. I would support an ordinance requiring all businesses and multi-family residences to recycle. There’s a huge problem here with respect to free-riders in context of our climate commitment. 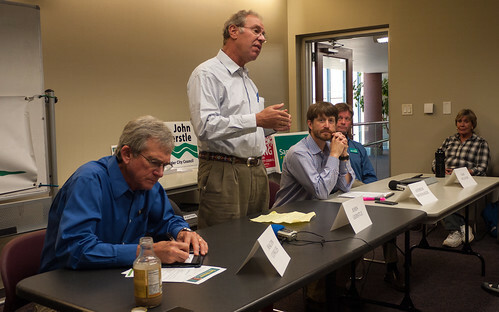 John Gerstle: I would support required recycling. I see little reason for resistance to that policy. It doesn’t take very long before it’s simply a normal part of daily life and business operations. Andrew Shoemaker: I have a business right down on Pearl and we recycle. It’s really a no-brainer. Of course we want to get it done city wide. The only question is how? This is a great example of staff striving to understand how these things work. They go and talk to other cities, and see what works and what doesn’t. It’s also going to be important to understand that different types of businesses are going to need different systems and incentives—a law firm and an auto shop and a grocery store are very different when it comes to their waste streams. Macon Cowles: I really want us to acquire Long’s Gardens, and shorten the distance from farm to plate. I want to focus on 15-minute neighborhoods. Two thirds of our capital investments have been made in bike, pedestrian and transit infrastructure. Downtown, we’ve got 60% of workers getting to work without driving. We need to continue supporting open space, and actually I think that the bike race on open space was okay. It was a great event, and I hope it comes back. John Gerstle: Boulder is rightfully proud that Boulder Creek didn’t make a mess—it really wasn’t a 100 year flood, more like a 25 year flood on the basis of the Boulder Creek’s flow rates. We need to be aware of that, and make sure we don’t rest on our laurels just yet. We need to continue our cooperation with the county on land use planning. If that cooperation breaks down, we’ll be in danger of losing all the progress we’ve made. Andrew Shoemaker: I think we need to focus more on children and families. They’re an important part of our town, and really the backbone of any community. Please vote in favor of Amendment 66 to fund education in Colorado. We also really need to deal with some behavioral issues downtown and on the creek path. Just a small segment of the homeless population is causing a problem. We also need to take care of the 800 homeless kids in the Boulder Valley School District—we like to imagine they don’t exist, but they do. We should also do a much better job of making our streets good for bikes—we already have a great path system. Sam Weaver: It’s time for us to move on to doing a commercial and industrial version of Smart Regs; more than 80% of our electricity-related emissions actually come from the business sector. First, we need to work on getting everyone baselined. We’ve got to continue the clean energy program going forward: please vote No on 310 and Yes on 2E. Regardless of the outcome we’re aiming for, we need to have our options open. I don’t have any kids myself, but I’ve got 12 nieces and nephews, 3 of which live in Boulder. We have to make good choices so we hand things off in good shape to next generation.